Build bike infrastructure and they will ride. It’s true just about everywhere, including San Diego. In late 2012 SANDAG, the region’s planning agency, installed bike counters around the entire county. The question to answer was: how many people were actually riding in the region? 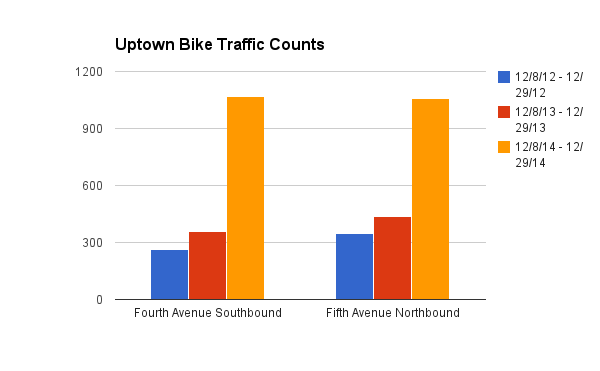 According to the count data obtained from SDSU’s Active Transportation Research, the bike traffic in Uptown has gone up — by an average of 346% since 2012. And it looks like the biggest jump in bike ridership happened after the buffered bike lanes were striped on Fourth and Fifth Avenues in 2014. Even in car-centric San Diego, if you build the bike lanes, people will ride. Elsewhere on the Network today: Wash Cycle reports that 18 percent of households in the DC metro region use bikes for transportation. The Dallas Morning News’ Transportation Blog writes that Mayor Mike Rawlings, a proponent of the Trinity Toll Road, says the Federal Highway Administration won’t stand in the way of the project. And Bike Portland says a flashing warning signal seems to have reduced right hook collisions involving bicyclists at a problematic intersection.